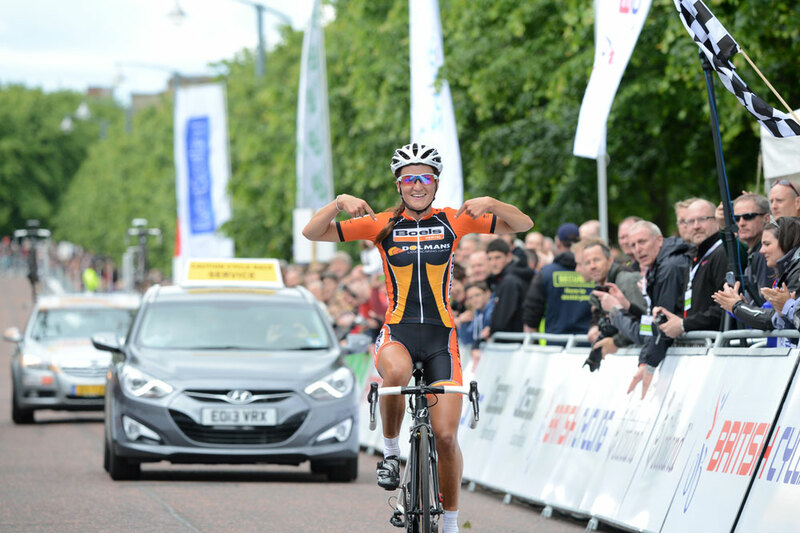 Lizzie Armitstead (Boels-Dolmans) soloed to win the National Road Race Championships in Glasgow this afternoon, her second win in the event in three years. Armitstead attacked in the closing stages of the race around the Scottish city centre from a four-rider group that formed on the fourth of eight 14.2km laps. Laura Trott (Wiggle-Honda) outsprinted her team-mate Dani King to take second – and win the under-23 title – while Jo Rowsell’s late heroics were enough for her to take fourth days after she won the National Time Trial Championships. “It’s really special. This was one of my main goals for the season – it’s been up and down so far, so I need a confidence boost. Hopefully having the jersey on my back will help,” said Armitstead after the race. Armitstead, together with Emma Trott, set the pace at the front of the bunch during the opening laps, and helped split the peloton on lap three. Amy Roberts (Wiggle-Honda) instigated the decisive break shortly after. Emma Trott followed, before Armitstead, King and Laura Trott bridged across. The leading five quickly built up an advantage, helped in part by a fragmented chase which saw riders scattered across the city centre in small groups. Defending champion Sharon Laws (Lotto-Belisol) initially made the split but was quickly dropped, and spent the following laps chasing with Katie Colclough (Specialized-Lululemon) and Claire Thomas. Colclough crashed out of the race on lap five, before Roberts was dropped from the leaders. Armitstead first split the leaders with an attack on University Avenue on the penultimate lap (which actually saw her team-mate Emma Trott lose contact) before a second attack the final time up the same climb was enough to see off King and Laura Trott. Having been in the second chasing group for a large part of the race, Rowsell bridged up to Laws’ group, jumped clear of that and caught Emma Trott in the final stages to take fourth.